DC Comics giving musician and writer Gerard Way his own imprint was one of the comics industry’s most surprising announcements this year, and the formation of Young Animal represents an exciting new phase for the publisher. 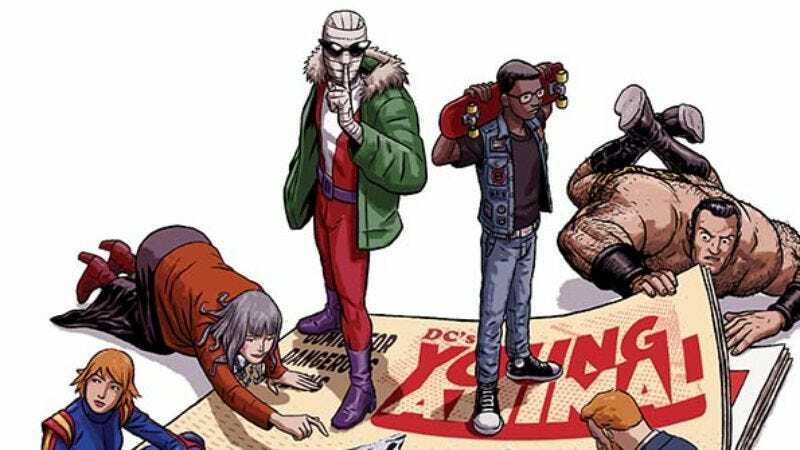 Dedicated to reviving the stranger properties at DC Comics, Young Animal definitely has an early Vertigo influence in its initial lineup, which includes new versions of former Vertigo titles like Doom Patrol and Shade The Changing Man (which is now Shade The Changing Girl). The imprint debuts with the launch of Doom Patrol in September, and The A.V. Club has a first look at art from the new series written by Way with art by Nick Derington and colorist Tamra Bonvillain. Doom Patrol is the first oddball to get a Young Animal revamp, and it’s one that Way has a strong personal attachment to. “I grew up reading Grant Morrison’s Doom Patrol and other books that paved the way for the Vertigo imprint,” says Way. “Stories that starred misfit characters from the DC Universe and people living on the fringes of society.” This new series reimagines established Doom Patrol characters like Robotman, Negative Man, Flex Mentallo, and Crazy Jane, but also introduces new figures like Casey Brinke, the EMT featured in these preview pages. Casey is the reader surrogate in Way’s story, and her intersection with the Doom Patrol sends her on a bizarre journey that forces her to come to terms with her own peculiar past. “Telling great stories via words and pictures is the ultimate form of self-expression,” says Way. “I can’t think of a better place to tell the stories that represent the alternative zeitgeist than DC’s Young Animal.” Readers can tap into the alt-zeitgeist when Doom Patrol #1 debuts on September 14, but in the meanwhile, here is solicitation info and some preview images to whet readers’ appetites, including the cover for the first issue, the cover art for Diamond’s Previews catalog (the first time DC has commissioned new art for Previews), and two pages of interior art. The main cover is actually a sticker that reveals another image when the gyro is lifted, and as silly as the gimmick is, it establishes that Young Animal is taking a different approach to monthly comics.